Sunday afternoons at three o'clock Bill and I would drive to an undisclosed location and take a random photograph which we designated as the target. Then we would slowly turn 360 degree taking several photos that captured the immediate surroundings. Remote viewers "see' the target from different reference points. Remote Viewers, at distant and various locations, were instructed to draw the target at the same time that we were photographing each Sunday afternoon at exactly three o'clock. Then they would sign, time and date the drawings and snail mail them to our home address in Helena, Montana. Juxtaposed against a winter sky this metal art instillation (photo on right) caught Bill's attention on our Sunday walkabout. We waited around until exactly three o'clock and then took this photo. ​The Remote Viewer who produced the drawing on the left was at a location over a hundred miles away from Helena when this photo was taken. She drew this at three o'clock on a Sunday afternoon. Her drawing even depicts the correct number of oblong metal tubes as well as the central tubes that bisect this art installation located at the Archie Bray Foundation in Helena, Montana USA. Zach was by far the most gifted and consistent Remote Viewer. In order to validate his results upon completion Zach would give his drawing to a third party who was not related to Zach. This person was responsible to date stamp the drawing, place it in a addressed envelope and drop it in a mailbox that Sunday afternoon. Zach drew this target which is a playground located at Memorial Park in Helena, Montana. In his drawing Zach even labels the slide to the right of the playhouse exactly where it is located as shown in the target photograph. Zach drew the target as shown above then drew the surrounding points of interest. He drew the actors on a stage which is north of the playground. ​The detail is remarkable. Note the black hat depicted on the actress to the left. The actress in the black hat was gesturing to the women on the far right a few seconds before we took the photo exactly as Zach portrays in his drawing. Zach even captured the hairstyle and curls of the actress on the right. Zach's drawing detailed an archway painted on the backdrop of the stage. Remote viewers often visualize a holographic perspective as if the viewer can see through walls and solid matter. In the center of the drawing of the archway Zach prints the word "car". There is a parking lot directly behind the stage. 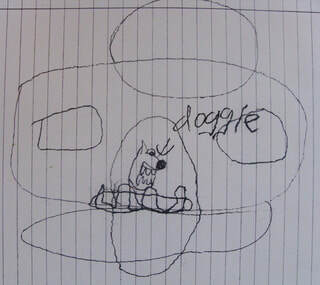 When this drawing arrived in Tuesday morning's mail we were curious about the "doggie" shown in the archway. The target was a red brick open art installation at the Archie Bray on the outskirts of Helena. This is the target photograph taken on that cold and snowy afternoon at the Archie Bray. Compare this photo to the drawing above. Bill and I returned to the Bray to check out the "doggie" and took this photograph through the archway. There are two life sized ceramic dog/wolfs behind this open brick building. The brown dog is seen at a distance through the arch just like Zach drew it. Silhouetted in a sitting position this gray ceramic dog/wolf is also behind the open brick building. Note the black nose, open mouth, flexed front paws and extended ears and compare these details to Zach's drawing above. Stella, who is Zach's grandmother reported that immediately after Zach completed the drawing on Sunday afternoon he called her to report, "There is a wolf and a dog there." These remote viewing sessions evolved out of a conversation with Zach's grandmother, Stella, in the fall of 2004. Stella was known as local Wise Woman. Seeking her counsel and confirmations, I drew the ley lines on this map connecting sacred places in the vicinity of Helena as we sat in the back room of Stella's local business. Stella's phone rang. It was Zach. I had not met Zach who was nineteen years old at that time and according to Stella had already displayed remarkable psychic talent. I was curious and intrigued by Stella's stories. Stella left the room as I set up strict protocols for the first remote viewing session. I labeled the map with numbers. ​Then I tasked Zach to remote view the landscape at site #2 on the map that I was holding. Zach was instructed to make drawings and send the drawings by snail mail to my address. ​remote location. See the EARTH ENERGY GRID LINES - GLOBAL PAGE. Site #2 on the map denotes a sacred place called the Shaman Rock. In the canyon above the Shaman Rock is the Shaman Cave. Above and to the right of the Shaman rock Zach drew a cave. 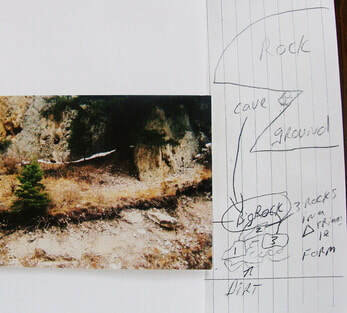 He even drew the rocks and gravel at the base of he cave and labelled them. Bill and I took Zach's drawings in hand when we took these two photos in the fall of 2004. Zach remote viewed these sites based giving him a number only and telling him that the number related to a location on a map that I was holding in my hands. After Bill and I verified the accuracy of Zach's first session we set up the protocol that every Sunday at three o'clock we would take photos at undisclosed locations. Only Bill and I would know where the photos were taken. Zach demonstrated extreme accuracy. He hit every target according to protocol. Then a time slippage occurred. We received this drawing in the mail on Tuesday. For the first time Zach had written a time notation above the drawing.... Sunday 3:00 PM. Zach accurately drew Sunday's target on the front. On the back of the same lined notebook paper was this drawing with the time notation. I was totally perplexed. Bill believed in Zach. With the drawing in hand, Bill retraced the exact events of the previous Sunday after 3:00 looking for clues. We entered the Mexican restaurant in East Helena where we had dined that paraticular Sunday night around seven. In the foyer of the restaurant, in front of the window was the ceramic fireplace in Zach's drawing. Zach had notated the time. This drawing was made four hours before Bill and I entered the restaurant. Remote viewers can often see forward and backward in time along probable timelines.